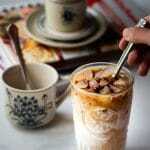 Vietnamese Coffee (Cafe Sua Nong) is delicious yet simple to make. The blending of strong coffee and condensed milk makes it so aromatic and intense that a sip can wake up all your senses. 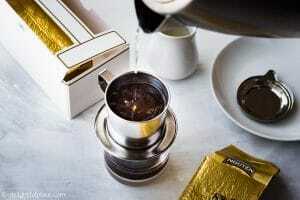 Drinking cafe sua nong starts with the mouth-watering nutty and chocolate fragrance. Each sip creates an enjoyable excitement no matter how many times you have tried the coffee. The rather-harsh initial bittersweet taste then fades away slowly leaving you some time to explore the complexity of the flavor. A serving gives you just a few sips, but they are enough for a satisfying coffee experience. Cafe sua nong is made from Vietnamese medium-ground dark-roast coffee, which is usually of Robusta variety and is brewed by a stainless steel filter called “phin.” I guess “phin” is the Vietnamese adaptation of “filter” in English or “filtre” in French. And do you know Vietnam is the largest producer of Robusta and the second largest producer of general coffee worldwide? Robusta is stronger than Arabica with a higher level of caffeine and a harsher bitter taste. To balance it, Vietnamese use sweetened condensed milk, sugar or creamed egg yolk to create a distinctive bittersweet flavor and strong nutty aroma. This recipe uses condensed milk, which is the most traditional way.
. 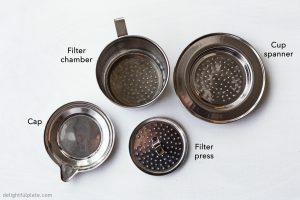 It is a Vietnamese coffee brewer, which contains a filter chamber, a filter press, a cup spanner, and a cap. The chamber and cup spanner contain small holes at the bottom. The coffee is brewed by pouring hot water to the ground coffee in the chamber, and the extracted coffee liquid will drip through the holes to a glass placed under phin. I recommend using a clear glass so you can watch the dripping process.
. I have heard that people also use French press to brew the coffee. is like the household name, but any brand available in your grocery stores will work. 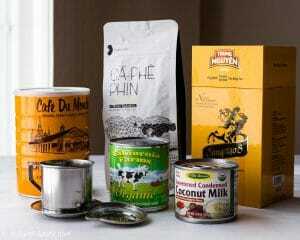 We even like using sweetened condensed coconut milk, which gives cafe sua nong an interesting coconut fragrance. 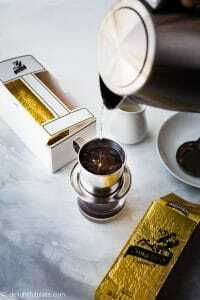 Brewing Vietnamese coffee is not complicated, but it requires care and attention to details. One essential requirement is to let hot water go through ground coffee without bringing any coffee particles to the glass. 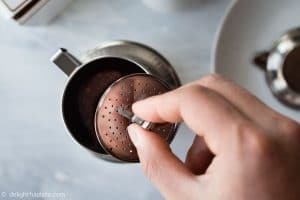 To do so, first, after adding ground coffee to the chamber, you need to use your fingers to wipe away loose coffee stuck at the bottom of the filter (the side facing the glass); otherwise, those coffee particles will fall into the glass. 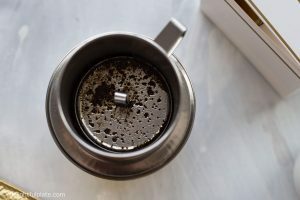 Second, you need to pour about 10-15 ml or 2-3 teaspoons of hot water to the filter chamber and wait for about 10-20 seconds to let the ground coffee swell and settle before adding the remaining hot water to the chamber. Phin comes with a metal piece, called filter press to help us control the density of ground coffee below it. A gentle press on the filter press usually provides enough pressure. If you don’t apply enough pressure, the coffee liquid will drip very quickly into the glass, which makes the coffee sour due to under-extraction. In that case, you need to press it a little more. And vice versa, if there is too much pressure, you might see no coffee drops coming out of phin. In that case, you may want to loosen the wet ground coffee with a small spoon. To get the best result, you need to control the dripping speed to make sure the brewing lasts about 4 minutes. Detailed instructions and step-by-step photos are in the recipe card. We also made the video above to show you how to brew the coffee. 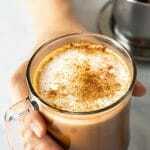 You may see that people often add sweetened condensed milk to serving glasses before brewing coffee into it. It is totally fine to brew coffee first and add sweetened condensed milk later so that you can control the level of sweetness. Also, feel free to adjust the ratio of ground coffee, condensed milk and water to your desired strength and sweetness. It may take 4-5 minutes to complete the brewing process so heat may be lost. If you want your cafe sua nong to be as hot as possible, you can preheat the glass before brewing by rinsing it with hot water. Or while brewing you can place the glass inside a small bowl containing hot water to minimize the heat loss. 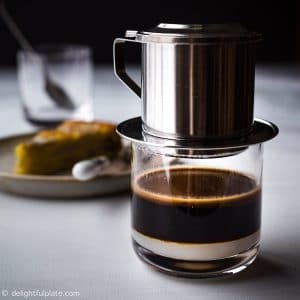 Vietnamese Coffee (Cafe Sua Nong) is delicious yet simple to make. The blending of strong coffee and sweetened condensed milk makes it so aromatic and intense that a sip can wake up all your senses. Add ground coffee to the filter chamber, try to spread them evenly inside the chamber. Look underneath to see if there is any loose coffee particles, use your finger to wipe them away (otherwise, they may fall into your cup of coffee). Then gently place the filter chamber over the cup spanner. Do not shake. Add sweetened condensed milk to the serving glass you will be brewing coffee into. Place the chamber and spanner over the glass. Place the filter press on top of the coffee inside the chamber and press gently. Add 1 tablespoon of hot water to the chamber and wait for about 10-20 seconds to let the coffee swell and settle. Add the remaining hot water and cover the chamber with the filter cap. Wait for the coffee liquid to drip into the serving glass through the holes at the bottom of the filter chamber and cup spanner. It is best to control the amount of coffee and dripping speed so that the brewing process lasts for about 4 minutes. You can adjust the speed by pressing the filter press. Once the filter chamber is empty, place the cap upside down, remove the filter from the glass and place on the cap. Use a spoon to stir to dissolve sweetened condensed milk with the coffee. Serve immediately. Feel free to tweak the ratio of coffee, sweetened condensed milk and water to your desired strength and sweetness of your coffee. Our recipe will result in pretty strong coffee which is not very sweet. 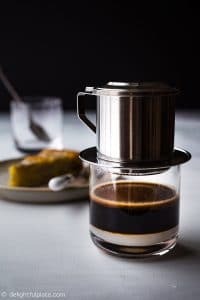 You can find the video we made to show all the steps to brew Vietnamese Coffee at the top of this post. The filter press helps control the density of ground coffee below it. A gentle press on the filter press usually provides enough pressure. If you don’t apply enough pressure, the coffee liquid will drip very quickly into the glass. In that case, you need to press it a little more. And vice versa, if there is too much pressure, you might see no coffee drops coming out of phin. If so, you may want to loosen the wet ground coffee with a small spoon. To get the best result, you need to control the dripping speed to make sure the brewing lasts about 4-5 minutes. Wow this is way more than I ever knew!